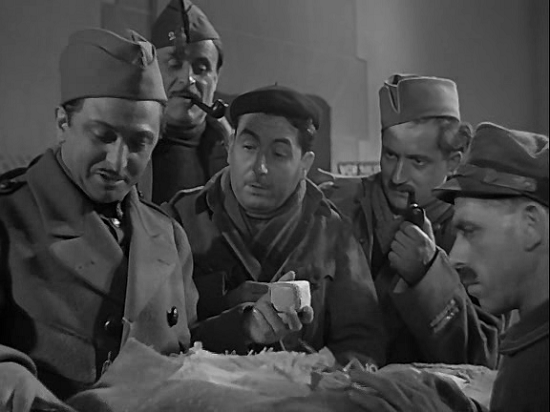 Frequently cited as the greatest anti-war film ever made, Jean Renoir's La Grande Illusion is an often witty, sometimes poignant, frequently moving examination of the futility of war. Franklin D. Roosevelt declared that “all the democracies in the world must see this film,” which is still sound advice. During World War I, two French airmen are shot down while taking surveillance photographs in German territory: Capt. de Boeldieu (Pierre Fresnay), a wealthy and aristocratic officer; Lt. Maréchal (Jean Gabin), a burly but intelligent working-class mechanic. The three are brought to a P.O.W. camp, where they encounter and befriend Rosenthal (Marcel Dalio), a prosperous Jewish banker, and the commander, Von Rauffenstein (Erich von Stroheim), takes an immediate liking to de Boeldieu.They are members of the same social class and believe that the political and intellectual ideals of the Europe they once knew will soon be a thing of the past with the rise to power of the proletariat. The three Frenchmen discover that their fellow prisoners have been digging an escape tunnel, and all of them agree to help -- Maréchal and Rosenthal with enthusiasm, de Boeldieu out of a sense of duty. As he puts it, when on a golf course, one plays golf, and while in a prison camp, one tries to escape -- it's the accepted thing to do. 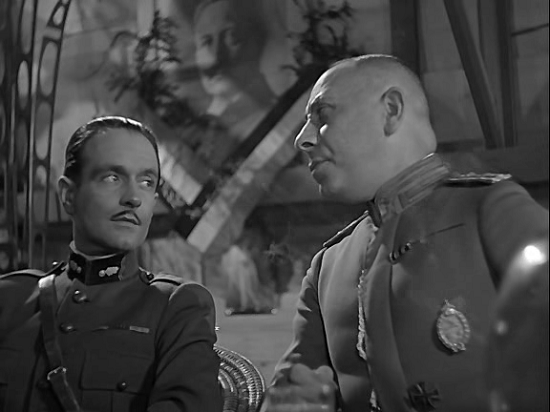 As Von Rauffenstein and de Boeldieu become friends, and the rank-and-file soldiers banter as much with the German guards as with each other, the characters seem involved less in a war than in some vast, petty game, albeit one with deadly consequences; they often talk about women and food, while never mentioning political ideology. In Grand Illusion, everyone learns to give and take, without betraying his essential personality, without denying differences of language and education. The prisoners sustain themselves with small delusions: digging a tunnel by night; dressing up in drag to remind themselves of the womanhood that has no place in prison life; celebrating the smallest and most fleeting of victories as news filters in from the front; or, most pathetic of all, Von Rauffenstein’s careful tending of a geranium in his fortress bedroom. 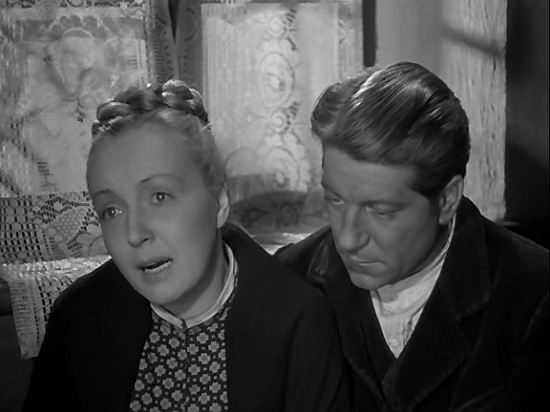 The plot of La Grande Illusion unfolds in a series of beautifully composed episodes, arranged like the scenes of a stage play. Sometimes the transition from one to another is made with a jump cut, such as the arrival of the guard to transport Maréchal and de Boeldieu into captivity; in many cases, there is simply a brief fade out. The scenes are united by the theme of escape, which Renoir visually expresses with a constant interplay of motion and confinement, restlessness and restraint. In almost every scene the characters are on the move, arriving and departing, walking around their room or across the parade ground, and—in the memorable train sequence—being shipped from one prison camp to another. But their movement is always abridged, by a closing door, a wire fence, an armed guard. All this changes when Maréchal and Rosenthal are able to break out of their fortress prison: suddenly, the walls that contained the prisoners' community are gone, replaced by an open landscape that is disconcertingly spacious and unbounded. The poetic realism of The Grand Illusion outlasted the savage conflict that had once engulfed it; now, it lives again, perpetually new in its passion and yet saddened by its own knowledge of the violent absurdity of war. Orson Welles named Grand Illusion as one of the movies he would take with him “on the ark.” Hard to disagree.